The future is already here. The world is our backyard. The US is more racially and ethnically diverse than it's ever been. It is now approximately 62% white and 38% people of color [i]. By 2043, estimates say the country will shift from majority white to majority people of color [ii]. Women are 51% of the population and 57% the US workforce [iii]. And 40% of our population are first or second generation Americans [iiv]. More than ever before, journalism and media organizations need to better reflect the diversity of our country to effectively and credibly tell the important stories of our world and our communities. Ever since PRI was founded as an independent not-for-profit public media organization, we’ve been committed to helping people hear a different voice™, valuing diversity and serving the public in the best possible ways. And as we enter into our next phase, PRI will be much more intentional and transparent in our efforts to be inclusive. We’re launching PRI’s Ambitious Inclusiveness initiative — a long-term effort and commitment. Simply put, Ambitious Inclusiveness means PRI’s staff, national board, and our storytelling and journalism better reflect the diversity of United States. To better tell ‘the full story’ of what’s happening in the world and meet our mission to help people live successfully in an interconnected world, Ambitious Inclusiveness is fundamental. When PRI more robustly reflects the US and the world, we find our content is more relevant, our reach and engagement grows faster, and we attract and retain amazing people to work on and realize our mission. Our impact grows and our revenue increases. Today, we're releasing an important tool in our efforts: PRI’s Inclusiveness Report 2016. 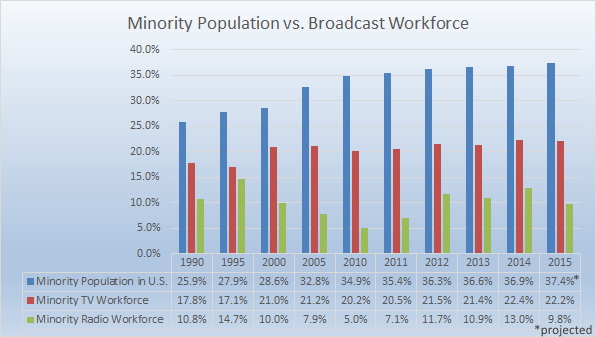 This report provides top line statistics on PRI staffing, leadership, board as well as examines the gender and race/ethnicity representation in our our stories across broadcasts and online. To start, we are keeping it simple and plan to provide more detail over time. We’ll update and track our progress. And we’ll consider what’s working, what isn’t, and respond accordingly. 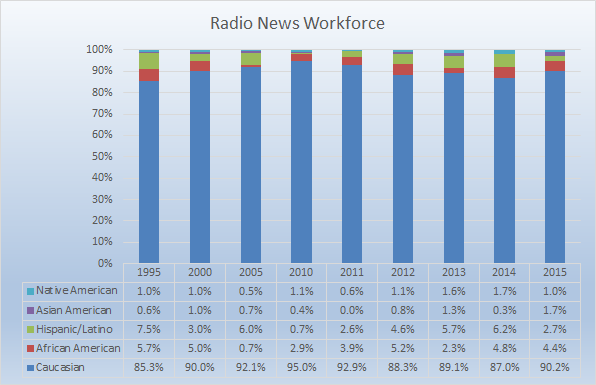 We compare ourselves to news industry statistics as well as the diversity and makeup of the major metro areas/states in which PRI has operations. For content, we track/evaluate the racial, ethnic and gender diversity in our bylines and sources by story, across platforms. How well do our stories represent the world? Ambitious Inclusiveness is holistic by design. It looks at our people and our storytelling. And it’s a journey. By tracking the diversity of PRI’s staff, board and content over time, we will learn more about what we should track and where to provide more detail. We’ll also better understand our content and engagement. After all, that’s what people experience when they read, watch, listen, and act on PRI’s stories. Over the last year, we began tracking these figures more intentionally and have seen progress. It’s in no small part to dedicated PRI team members who value Ambitious Inclusiveness, and have a deep desire for PRI to make progress. To provide us with an even more complete picture of our work, we also plan to track additional underrepresented groups in our efforts in the coming year including representation of sexual orientation and identity, and people with disabilities. We expect that our philosophy and approach will evolve. This initiative is a ‘working beta’, which means we will adapt based on emerging best practices, feedback and what we learn by putting it into practice. We hope our Ambitious Inclusiveness efforts add to an important conversation amongst people and organizations who are committed to a vibrant future for journalism. Working for PRI- We're looking for great people in a variety of capacities, check out these opportunities. As you read our Inclusiveness Report 2016, you’ll see how our initial statistics compare with external benchmarks. We need to improve and advance our racial and ethnic diversity in our staffing, supervisors/management and board. We are committed to doing so. In terms of PRI staff, supervisors and Board, we’ve made great strides in gender parity and far outperform external benchmarks. Women bylines and sources are high as compared to external benchmarks. Racial and ethnic diversity in bylines and sources provides a base to work from but more diversity is required to be a best-in-class performer. We used these benchmarks from external sources to gauge how PRI measures up across staffing, leadership, board and content (bylines and sources). Women are less than a fourth (23.3%) of those in top-level management and only a moderate third (35.3%) of those in governance (i.e., company board rooms). Women are 38% of the workforce for print dailies (relatively unchanged for over a decade). At online-only organizations, women make up about 50 percent. Women are 34.6 percent of US newsroom supervisors in 2013. That figure peaked at 35.6 percent in 2006. 17% of employees at print dailies and 23% at digital only sites are journalists of color. Newsroom leadership (Broadcast) -- In the positions of general manager, news director, assistant news director, managing editor, assignment manager, executive producer or web manager - 11 percent of these managers are people of color, a figure that is consistent with NABJ studies of other television newsrooms from previous years. In 2013, 63.4 percent of those with bylines, on-camera appearances and producer credits were men, while women constituted 36.1 percent of contributors. PRI’s content analysis is based on a representative sample of 410 stories published from January 2015-June 2016 aggregated from 1) PRI.org, which contains content from PRI’s The World repurposed for the web, original digital content, and curated content from PRI’s portfolio and online content partners; 2) our co-productions The Takeaway (TheTakeaway.org) and Studio 360 with Kurt Andersen (Studio360.org). Stories were selected across a representative week per quarter as follows: The first Monday and Tuesday of the first month, the second Wednesday and Thursday of the second month and the third Friday, Saturday, and Sunday of the third month. In this way the stories selected would not be overly skewed by major breaking news or by series. Bylines were based on who was listed on the websites and/or confirmed by editorial leadership. Sources from stories that were broadcast interviews only include people the host interviews at length; it excludes audio clips from press conferences or other widely used clips. Sources from field broadcast reports only include people the journalist spoke to and included in the report. Sources from digital articles include people a journalist directly spoke to and was quoted in the story. An PRI staff member determined the demographics of bylines and sources by checking online to cross reference biographical details and/or confirming with editorial leadership. The n’s are based on total bylines and total sources, respectively, which will include duplicates. For instance, if the same reporter was listed as a byline in two separate stories in the sample, the reporter is included twice as we are tracking the number of times that reporter is featured in our content.